Nine brilliant book worms with college degrees and nine versatile entrepreneurs armed with only a high school diploma will enter the boardroom on January 20 kicking off the third season of NBC's "The Apprentice." Who will succeed and who will fail? Gone is the battle of the sexes, front and center is "book smarts" against "street smarts," theory vs. practicality. "For the third season of 'The Apprentice,' Mark Burnett (Creator & Executive Producer) and I have decided to take the series into a new realm," said Donald Trump, Executive Producer. "We wanted to see what would happen if we pitted college grads ("book smarts") against high school grads ("street smarts"). The result makes for fascinating television. Who will you root for? You'll also discover that we chose candidates who are more relatable--- along the lines of Sam, Troy and Amy." Trump's trusted advisors, George Ross and Carolyn Kepcher will both return for a third season. Tasks will once again feature some of the biggest companies in the world and the weekly rewards will be better than ever. Expect plenty of new rules, new twists and boardroom shockers. As the winner of the competition, the third "apprentice" will be granted the dream job of a lifetime with The Trump Organization and a hefty six-figure salary. 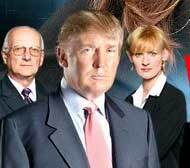 "The Apprentice" premiered Jan. 8, 2004 and immediately became a cultural phenomenon, scoring the highest ratings for any new series introduced throughout the 2003-04 season and outscoring every established series in the key adult 18-49 category except "American Idol." "The Apprentice" resumed its hot streak in the fall, delivering the strongest 18-49 ratings of any unscripted series through the first half of the 2004-05 television season and the #3 18-49 average among all series. "The Apprentice" also continues to deliver the strongest concentration on primetime network television of upscale viewers in such key categories as adults 18-49 living in homes with incomes of $75,000 and more. In a live event from New York University's Skirball Center in front of a packed house, Tana and Kendra returned to find out who would hear those magic (and rare) words: "You're hired." Under questioning from Trump, Tana admitted that she had made a mistake by judging her employees and calling them "The Three Stooges." Tana said that she had personally apologized to Kristen, Brian and Chris. Tana added that she always learned from her mistakes. But Trump interrupted and was brutally honest. He told Tana that she faced an uphill battle to become The Apprentice. Trump turned to Kendra and, referring to Kendra's tears as she said goodbye to her employees, told her he didn't like crying and saw it as a sign of weakness. Kendra said that she had seen 300 pound linebackers cry as they raised a Super Bowl trophy in victory - so she was not ashamed. Kendra said that she cried out of great joy and pride. Even Trump admitted that as crying goes, it was a nice moment. Trump then laid out the two projects that his new Apprentice would have to choose from. The first was to work with The Miss Universe Pageant, dealing with potential host cities and then organizing the event. The second project was to oversee the renovation of Palm Beach Mansion, a 68,000 square foot oceanfront property in Florida. Tana said that if given the choice she would, without a doubt, select The Miss Universe Pageant. Kendra, just as passionate about her choice, said she would take the Palm Beach Mansion project.